Please join us Tuesday November 9, from 1-1:30 pm ET (10-10:30 am PT) for a 1/2 hour presentation about the land grant program in ScienceSim providing free 100,000 object regions for six months in ScienceSim. Details about participation in this program will be presented and information about applying for a region will be provided. Tuesday, November 9th, 1-1:30 PM ET/10-10:30 AM PT in the 21C region in Second Life. Please note we are punctual and start promptly at the hour. If you cannot make these events, please send a request through your organizational email to admin at fashionresearchinstitute dot com. Please note we cannot respond to requests from noninstitutional addresses (e.g., yahoo, aol, hotmail, etc) and that we cannot accept applications from consultants or commercial entities. Please join us Thursday November 4, from 2-2:30 pm ET (11-11:30 am PT) for a 1/2 hour presentation about the land grant program in ScienceSim providing free 100,000 object regions for six months in ScienceSim. Details about participation in this program will be presented and information about applying for a region will be provided. Thursday, November 4th, 2-2:30 PM ET/11-11:30 AM PT in the 21C region in Second Life. Please note we are punctual and start promptly at the hour. If you cannot make these events, please send a request through your organizational email to admin at fashionresearchinstitute dot com. Please note we cannot respond to requests from noninstitutional addresses (e.g., yahoo, aol, hotmail, etc). 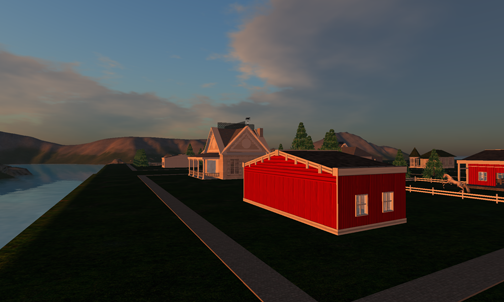 We’ve been hard at work completing agreements and getting our first wave of land grant recipients settled in in our homesteading regions in ScienceSim. This is the first opportunity we’ve had to post any images from some of the settled regions. Shown here are some images from Brian Quinn’s simulation of Point Reyes; parcels for John Walber’s Learning Times; Peter Blair at Utah State University; and the fashion design interns at Fashion Research Institute. 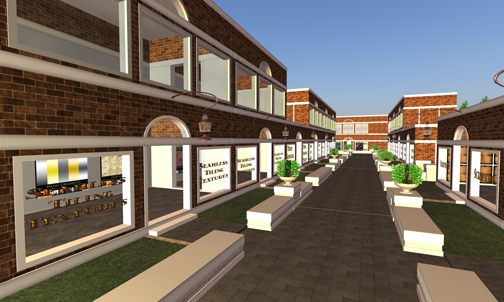 Also shown are some of the common spaces, such as the common space parks, the shopping facility for ScienceSim licensed content; and the public sandbox in Einstein. Through our research collaboration with Intel Labs, Fashion Research Institute is overseeing the ScienceSim land grant program, as announced in this blog post. We’ve been provided with 18 regions, which have been divided into 1/4 region parcels. 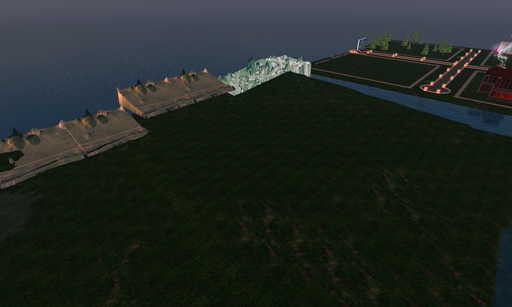 Each parcel can contain about 8,000 prims. 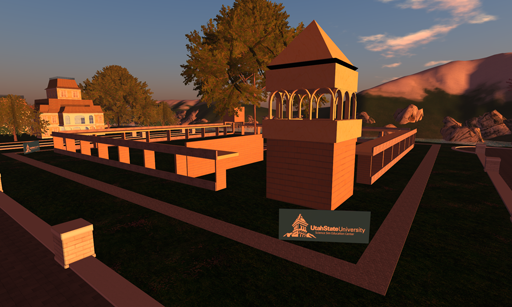 The regions will be awarded for a six-month period to educators, scientists, and researchers who wish to explore using OpenSim for their work, but who have not yet managed to have a presence in OpenSim. These regions will be provided for six months, with the program scheduled to end June 30, 2010. 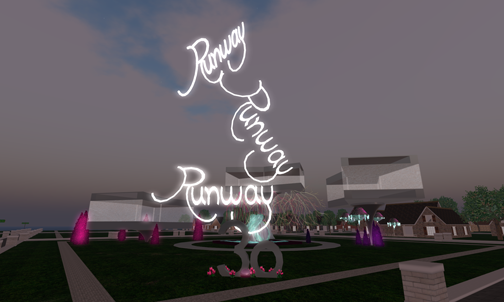 Users will sign a formal agreement with Fashion Research Institute for use of this land. The following covenant has been developed from our experiences working with new users through our official Community Gateway in our Second life islands of Shengri La. Over the last year, we have had more than 60,000 new users enter through our region. In addition to those new users, we also host thousands of more experienced users who visit our regions for various events and shopping. Handling this level of traffic has presented us with an opportunity to develop functional best practices for educational and professional use for virtual land management and users of our programs. We have drawn from this body of work to develop the covenant that will govern the land grant program. This covenant is based on facts and data. 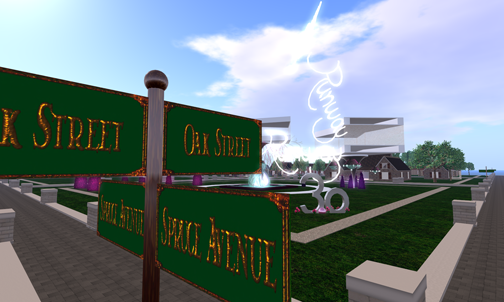 In our Second Life islands, we enforce our covenant stringently, which minimizes antisocial and unprofessional behavior. Our data shows that enabling users to engage in antisocial behavior slows the immersion process because it creates a hostile environment. The intent of the land program covenant is to clarify what our expectations are for users of this program so that all users may experience a working environment free of unprofessional behavior. Thank you for your interest in the ScienceSim land grant program. 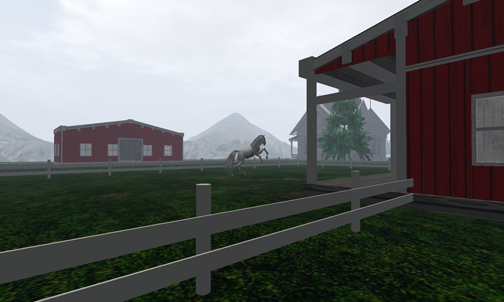 The virtual land provided through the land grant program is intended to help educators, scientists, and researchers evaluate the OpenSim platform for use in their extended programs. This land is provided through June 30, 2010. Land is assigned in 1/4 region parcels with up to 8,000 objects per parcel. Land assignees have building privileges. Terrain textures are applied which remain in common to all parcels in the land program. Common access features such as paths and parks are included to enable visitors to freely move between parcels. Assigned land must be built on within three weeks of assignment. Land which is not improved within four weeks of assignment will be reclaimed, and any objects placed in the region will be returned to the land assignee. 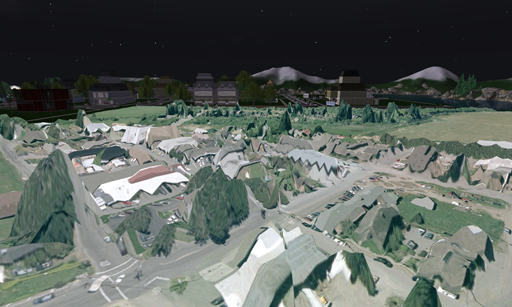 Selected content is provided for the use of land grant recipients, including premium avatar content, default avatars, textures, office equipment, and buildings. This content is provided only for the use of residents of ScienceSim under various licenses, and may not be removed from Sciencesim or otherwise used to develop derivative works anywhere except in ScienceSim. Users are encouraged to create their own content as well. Pirated content will be removed immediately. A complete orientation gateway which has been successfully used with more than 50,000 new users is provided for the use of land grant recipients and their program users. ScienceSim serves a population of educators, researchers and scientists. Land grant recipients are expected to register with their real names and to manage their programs appropriately. All users are expected to behave with decorum and respect to others to support this collaborative, interdisciplinary working environment. Services are provided in English only. All users who enter and use this grid are expected to behave and dress in a manner appropriate to a corporate or academic setting. All users are expected to respect others’ beliefs; no solicitation, proselytization, foul language or harassment of any sort is allowed here. Clothing is mandatory – this means at minimum, shirt and trousers that meets typical community decency standards. Land grants are provided with an expectation that users will have sufficient expertise to develop their own regions. There are weekly user meetings at which user experiences can and should be reported, as well as a mailing list where feedback is encouraged. Lastly, there is a weekly governance meeting at which any conflicts will be arbitrated. On Thursday, January 7th, 10 am PT/ 1 am ET, we’ll be touring the land grant regions. Please meet in the Newton welcome area in ScienceSim. Please join us on Tuesday, January 5th, Wednesday, January 6th, or Thursday January 7th for a presentation about the land grant program in ScienceSim. Details about participation in this program will be presented and information about applying for a parcel with be provided. On Thursday, January 7th, 10 am PT/ 1 am ET, we’ll be touring the land grant regions. Please meet in the Newton welcome area.